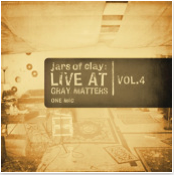 Our latest EP is available now: "Live At Gray Matters, Vol. 4: One Mic.” Check it out on iTunes. Also be sure to catch us out on the road with our friends Matt Maher, Derek Webb and Audrey Assad for The Shelter Tour. Visit our tour section for a complete list of dates.